Free-to-play core game developer Kabam has announced the release of Kings of the Realm on iOS devices. The franchise offers a cross-media experience for consumers, as the game has been launched alongside a new book, published by Penguin, titled Kings of the Realm: Cruel Salvation. This is the second book in a series, which provides mobile players a look at the characters and backstory behind the mobile game. 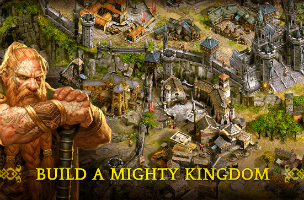 In the Kings of the Realm mobile game, players travel to a medieval world, where they’re placed in charge of growing a kingdom in terms of both economics and resources, as well as with a capable military force. Gamers build production buildings for the game’s base resources, which include timber, ore, food and stone. Players can spend resources to upgrade these structures and increase their overall production rates. Resource storage is also a factor, so players must upgrade their storage facilities along with the production buildings. Building tasks can only be assigned if the kingdom has available workers to complete them. Players can purchase additional builder slots, and even instantly speed up building tasks, with premium currency. Interestingly, when players level up, they’re given the choice of either premium currency or free currency (in a larger amount) as their reward. It should also be noted that building tasks under five minutes can be completed instantly for free. While players are waiting for upgrades or buildings to complete, they can turn their attention to the game’s military system, which sees users commanding up to 15 unlockable commanders. Each can be assigned their own army, with up to 21 different troop types, including base militia, archers, spearmen, brutes, martyrs and many others. Only the base militia unit is available by default, but users can unlock additional unit types by building specific structures in their kingdom. A quest system helps players out along the way, and rewards users with bulk resources for each completed quest. By downloading the game on iOS, players will have access to an exclusive commander, Maerwyn. Each commander offers bonuses for different troop types, and can level up over time by being sent into combat. Battles take place on the world map, as users can send their troops to pillage AI villages, or attack other real-world players. Battles take place automatically in the background. For social play, a chat system allows users to talk to other players, and gamers can join alliances with others and capture shrines on the world map. These shrines offer individual and alliance-based bonuses when captured. Limited time tournaments are also available, which may ask players to earn points by collecting resources within their own city, for instance. In this particular example, the rewards for placing highly in the tournament are free military units. Kings of the Realm was developed by Digit Game Studios, a 20-person team from Dublin, Ireland. It’s the company’s first game. Kings of the Realm is available to download for free on iTunes.